Cyrsti's Condo: Another Shopping Weekend? As the Trans Ohio Symposium grows ever closer, the last weekend in April, I still haven't done my shopping yet for the weekend. I know what I would love to find, but finding it in my size is always the difficult part. A top which falls off of one shoulder is on my wish list but we will see. Fortunately, in my area, there are a multitude of places I can try to go with my partner Liz. Plus, I still have quite a bit left I need to spend off a gift certificate I received as a birthday gift from my daughter some time ago. I have been saving it back for a time such as this, so it is time to use it. To make matters more interesting is the long "Boho" skirt Liz bought me Sunday. It is black, so any spring color ought to go with it, I would think. At least I have a couple pictures to remind me what I wore before to the Symposium. 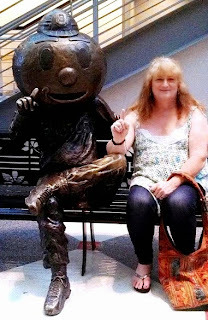 Which for the past several years has been held at The Ohio State University Union...thus the picture with mascot "Brutus" on the right. Also, Liz and I have to factor in getting our nails done before we go! It was worth quite a bit! Been stashing it back for the right occasion :) Plus the seasonal change is a great time to update!